The word orthodontics typically calls to mind an image of an adolescent with metal brackets and wires on their teeth. Today, Invisalign is changing the way that people think about orthodontic treatment. Using clear, comfortable alignment trays, the Invisalign system makes it easy for patients of all ages to achieve their ideal smiles. The Dental Center of Jacksonville team is proud to be a trusted Invisalign orthodontic treatment provider. If you want to learn more about Invisalign or find out whether or not you’re a candidate, contact our team to schedule your orthodontic consultation today. Invisalign uses a series of clear, plastic alignment trays to shift teeth into their ideal alignment over the course of about twelve months of treatment. 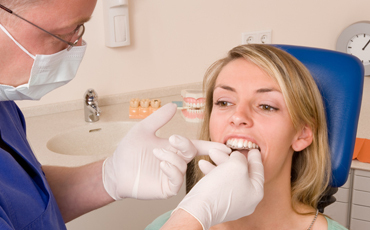 Each set of alignment trays represents the smile one step closer to the desired end result. 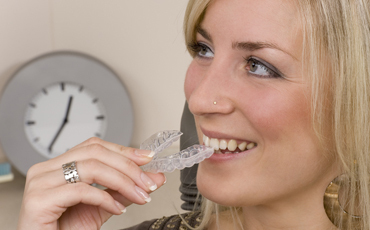 Patients wear their aligners for about two weeks at a time. Then, they switch to the next set in the series. Every six weeks to two months, patients will visit our office, so we can check the progress of their smiles to ensure they are in line with their treatment plan. During these visits, we can adjust the plan to help patients get their flawless smiles quickly. 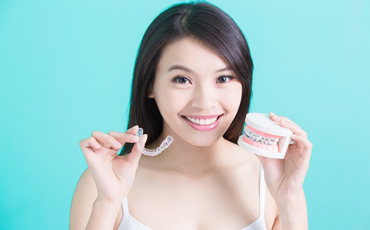 The cost of Invisalign varies widely based on the specific treatment case, but most patients can expect to pay between $3,500 and $8,000 over the course of treatment from start to finish. This is slightly higher than the average cost of traditional braces, $2,500 to $6,000. For some patients, the difference in price is worth the added benefits, but the decision is really up to you. Insurance is another consideration. Some providers do cover part of the cost of Invisalign, but even those who do offer some benefits for Invisalign, provide a higher percentage of coverage for traditional braces.